What’s magic about 10,000 steps? That’s the claim is a research recap done by The Guardian. How physically fit are folks in your city? Washington, D.C. rated as “most fit city” for 3rd year in a row. Every year, the American College of Sports Medicine and the Anthem Foundation rates the “fitness” of major metro areas based on a number of health behaviors and environmental factors such as access to parks, recreational facilities and walking trails. 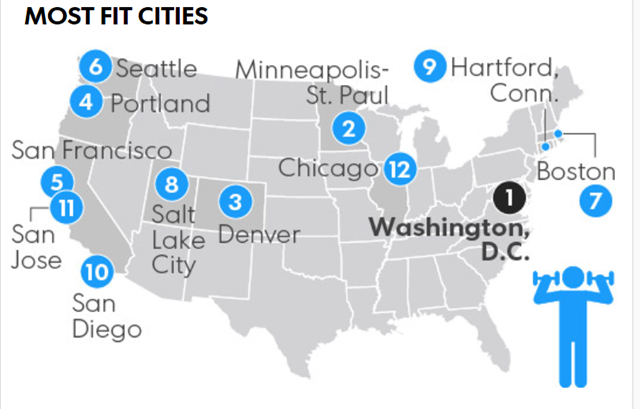 According to this year’s report, Washington, D.C. topped the list again. What makes D.C. so fit? Which of the 50 biggest metro areas scored the worst? Fitness: How many marathons did YOU run last year? If the answer is less than 366, then Annette Fredskov of Næstved, Denmark might think you’re a slacker. According to the Copenhagen Post, 41-year-old Fredskov just completed a full year in which she ran a full marathon every single day. That’s except for the 365th day … when she ran 2 marathons back-to-back … to up her total to 366. She averaged about 11 minutes per mile for the 9,589 miles. Hit the “Good Gym” … then jog over to Granny’s place and make her eat an apple. Punch line: Want to do more than simply getting in shape? How about literally running an errand for someone else – maybe picking up their groceries? The Good Gym connects interested people who seek more “meaningful ways to exercise”? The Good Gym pairs runners with the elderly and less-mobile people in the neighborhood and have joggers run to their house to deliver something nice, such as a magazine or a piece of fruit. Editorial note: Be sure to make it a large print mag or soft fruit. Otherwise, Granny may swat you with a stick. The runner is also encouraged to have a small casual chat with the immobile person before heading home. The Good Gym project is currently looking for interested people who wish to establish a branch in their community. Takeaway: Decompress before your next flight through SFO airport by using the yoga room built in Terminal 2. Based on a passenger suggestion, this yoga studio is considered the first of its kind globally. Namaste. Just cleared airport security and in need of a little deep breathing and stretching relaxation? San Francisco Airport has opened what it calls a first of its kind yoga room, and while it’s not quite a mountaintop in Tibet, airport officials say the low lights, and soothing blue walls aim to afford travellers, stressed out or sanguine, an oasis of calm in which to flex, twist and decompress. “As far as we know it’s the first (yoga room) at an airport anywhere in the world,” said Michael C. McCarron, director of community affairs for the airport. He said the idea for the room, in the newly refurbished Terminal 2, came from a passenger suggestion at an open house. It joins the Berman reflection room, a space intended for silence and meditation located before Terminal 2 security. TakeAway: For $150 – more than a year’s gym membership at Planet Fitness – you can purchase the Nike + Fuelband to track your every ‘move.’ This new rubber bracelet measures your activity level, and even syncs with an iPhone. While the large majority of athletic gear is segmented for each specific sports market, Nike announced a product that sweeps across the entire sporting landscape and can be used by any athlete at any level. The price is $150, “about 50% more expensive than the similar Fitbit device” . The WSJ offered up 27 Rules of Conquering the Gym. 4. No one in the history of gyms has ever lost a pound while reading a book, magazine or newspaper and slowly pedaling a recumbent bicycle. No one. 21. Muscle shirts are for people with muscles, and rhythm guitarists. 27. There is no secret. Exercise and lay off the fries.